Yuta Asano ’15 (color science) puts the magic in mobile devices and enhances the tiny cameras we carry everywhere. 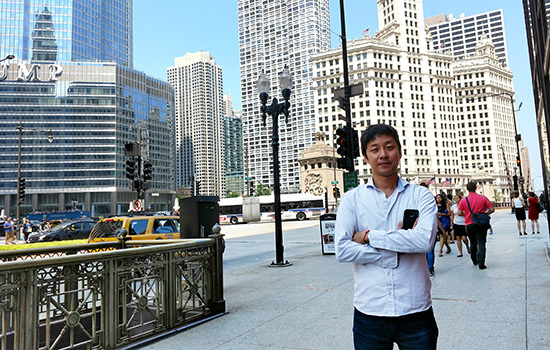 His work as a camera image algorithm engineer at Motorola Mobility in Chicago has improved the color image quality of Motorola’s smartphones: the Moto G4, Moto G4 Plus, Moto Z Droid and the premium Moto Z Force Droid. Asano joined Motorola in July 2015, shortly before officially graduating. The mobile communications company employs a handful of RIT alumni with master’s degrees in color science—a field that combines physics, optics, chemistry, computer science and mathematics with knowledge of the human vision system. Asano is the first Ph.D. from RIT’s Munsell Color Science Laboratory to work at Motorola; his doctoral degree puts him in a rarified club of alumni who share a curiosity about color and an impulse to parse light on a high level. “I came to RIT to study in the color science program because it’s pretty much the only one around the world,” Asano said. Asano is originally from Okayama, Japan, about a day’s drive from Tokyo, and earned his BS and MS degrees in architectural engineering at Kyoto University. His graduate work concentrated on lighting engineering and the perception of brightness and included an internship with Panasonic Corp. in Osaka, Japan, developing LED backlighting for televisions. Manipulating light in architectural space and on screens made Asano curious about how people perceive color—or light at different wavelengths. “Lighting is not just limited to architecture, and I wanted to expand my knowledge to other applications,” he explained. At RIT, Asano moved beyond illumination to learn how the human eye sees color. His interest in color vision led to two internships with Technicolor in Rennes, France, where he worked on color-image quality and color perception related to digital cinema. Another research project related to color-vision and printers took Asano to Munich and Darmstadt, Germany, to collaborate with scientists at the Fogra Institute, a German-based association that promotes standards and technology in the graphic arts. Asano published his thesis research on personalized color management for digital cinema in the Feb. 10 PLOS ONE article, “Individual Colorimetric Observer Model.” His co-authors on the paper are Mark Fairchild, RIT head of color science and associate dean of the College of Science, and Laurent Blondé, principal scientist at Technicolor. The reverse is true too. Asano’s research would also allow manufacturers of colored materials to reliably predict color mismatches for a product. Some work at Apple, Motorola Mobility, Onyx Graphics and Qualcomm. Others have chosen academic careers at RIT and the University of Rochester.